30.0 kg. , 66.1 lbs. We were heading back to the boat to call it a day. i was about to lift myself up to the swim platform when i saw a shadow in the distance. It was a nice sized rockfish so i slowly put my hands back in the water and started following the fish. It went into a nearby cave and holed up. On my first drop its tail was showing and then when i dropped the second time its head was showing. It was a small hole but i got a good shot i thought. The fish came barreling out of another exit and luckily went into the next cave. It was sitting broadside in the back this time in a large cave. I put another shot in and he cruised out of that cave and back into the first one. 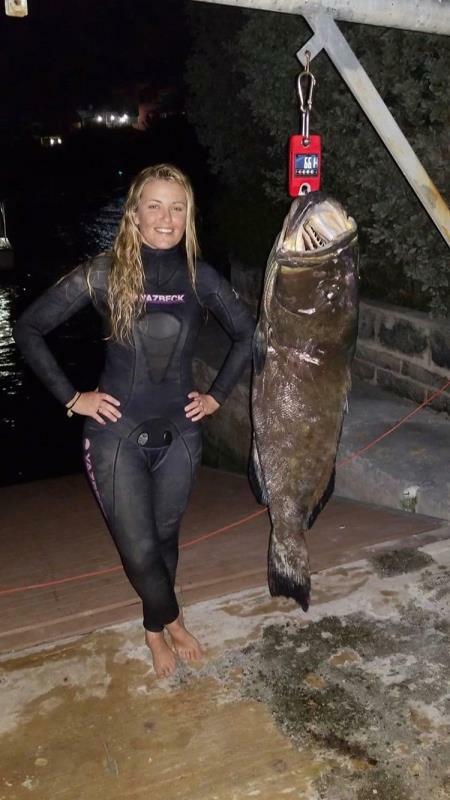 I was able to finally pull the grouper out after about an hour. All in all it took me about 2 1/5 hours, 3 shots, 2 spears and countless dives trying to get the fish out of the small opening. It was tough and I got pretty lucky but had great dive buddies and fun getting the fish to the boat.